I have enjoyed Chafer much more in my ministry than I did as a student. Perhaps because now I don’t have anyone telling me how “shallow” he was. I still find his book True Evangelism to be the best I have read on the subject. 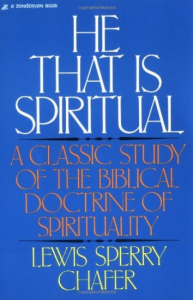 In this area of the filling of the Spirit, I appreciate Chafer’s deep love for the Spirit’s moving and yet his understanding of theological distinctions which keep one from present day excesses. He does not believe a Christian loses the sinful nature until resurrection and he is very strong on positional truth in regard to the crucifixion of the believer in this life.